The ambiance of our room and the view from our terrace. The rooms were spacious and clean. Great staff. George was fantastic providing all the info we needed and providing the services we asked for. Best location ! Front view for sunset . Perfect for sunset! The staff are very friendly and helpful .. the view from the balcony is a dream .. the bus station is 5 min walk, from there u take the bus to oia or fira .. the views from imrovigli is just breathtaking .. just heaven on earth ! The caldera/Sunset views were unbelievable from out terrace. Breakfast was great every morning. Greg and Helena were very helpful in helping us plan activities. Recommend this hotel highly! Classic west view of caldera and sunset. Roomy apartment with big terrace area. Cool at back of cave (bedroom) and good AC at front. Good wi-fi. Nice decor. Excellent service. Excellent location, great accommodation. Villa Lukas has one of the best views at immervigoli. Helena (staff) is very welcoming and helped us a lot with many bookings around the island and advised where to go and see. Thumbs up for her. Alena, the host, is terrific. Really helpful and fun. Great person. Location is fantastic. Villa Lukas was absolutely fantastic! The staff was extremely friendly and helpful. They gave us a room upgrade free of charge that had the most beautiful view! The breakfast was delivered to our door in the morning and it was amazing - and included in the price! We would go back to Villa Lukas in a heart beat! We loved it!! Lock in a great price for Villa Lukas – rated 9.2 by recent guests! 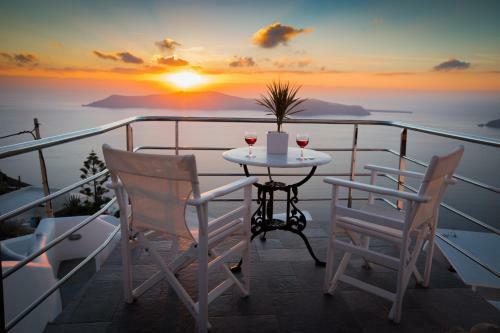 Cycladic-style Villa Lukas is located in picturesque Imerovigli, 1,312 feet above sea level. It offers accommodations with views over the Caldera, the volcano and the famous Santorini sunset. Free WiFi is available. 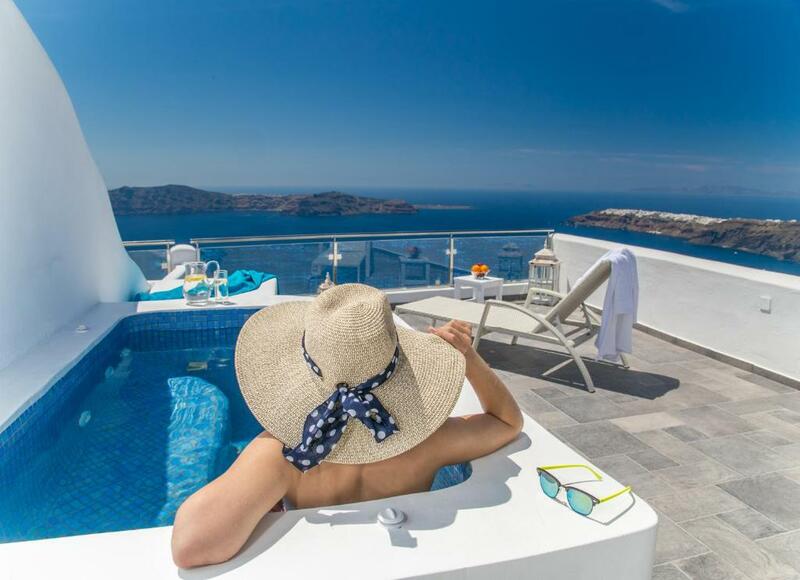 The charming Cycladic rooms and the luxurious suites are air conditioned, and feature domed ceilings and concrete beds. Each is equipped with a safe, satellite TV and private bathroom with free toiletries. Fira is 1.2 mi away, and there are many restaurants within 350 feet of the hotel. Kamari Beach is at 5 mi. There is free parking, right outside the property. Car rental, airport transfer service can be arranged on site. This is our guests' favorite part of Imerovigli, according to independent reviews. This property also has one of the top-rated locations in Imerovigli! Guests are happier about it compared to other properties in the area. This property is also rated for the best value in Imerovigli! Guests are getting more for their money when compared to other properties in this city. 뀐 Located in the top-rated area in Imerovigli, this property has an excellent location score of 9.7! When would you like to stay at Villa Lukas? Featuring a bed carved in the rocks, this studio offers access to the terrace overlooking the caldera, the volcano and the sunset (you need to go up 12 steps). No extra beds can be added in this room type. Please note that this room type does not have a hot tub. Traditionally decorated, this studio has a private balcony with views over the Aegean Sea, the Caldera, the volcano and sunset. It features a built-in or iron bed and a seating area with built-in or wooden sofa which can accommodate an extra guest. This traditionally decorated room has a spacious terrace with views over the Aegean Sea, the Caldera, the volcano and sunset. It features a built-in bed and a separate seating area with two built-in sofa beds. Please note that this room type is for four people and cannot accommodate an extra bed. Located on the top floor, this spacious suite opens to a terrace with an outdoor hot tub and views of the sunset and the volcano. The mosaic bathroom comes with a shower cabin and luxurious bathroom amenities. A bottle of local wine and a fruit basket are offered upon arrival. 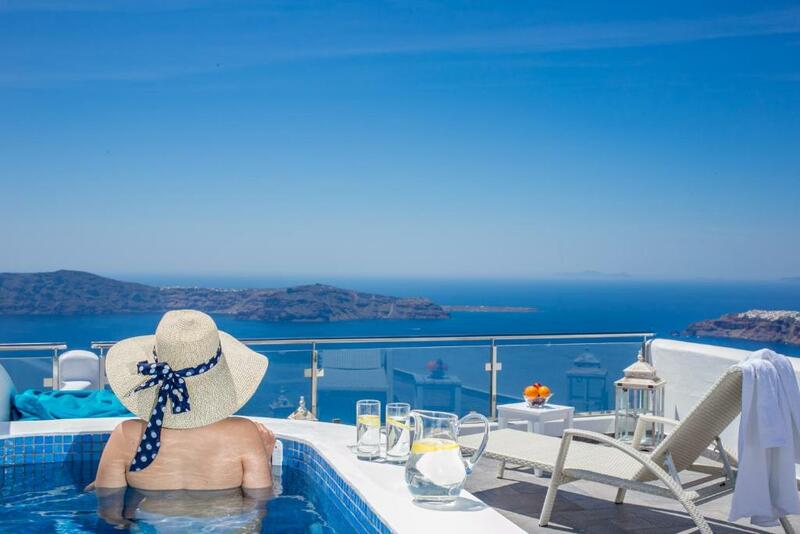 Located on the top floor, this air-conditioned and stylishly decorated suite opens to a 20-m2 private terrace with a private outdoor hot tub and views over the Caldera, the volcano, the sunset and the Aegean Sea. It features a bedroom with large double bed and a living room with sofa. The mosaic bathroom comes with bathroom amenities, bathrobes and slippers. This apartment is set in the annex building. House Rules Villa Lukas takes special requests – add in the next step! Villa Lukas accepts these cards and reserves the right to temporarily hold an amount prior to arrival. Please let Villa Lukas know your expected arrival time in advance. You can use the Special Requests box when booking or contact the property. Reception hours: 8:00 to 22:00. There is a shuttle service upon request and at extra charge. Please inform Villa Lukas in advance if you want to use the service. Please note that the property has no pool. Please inform Villa Lukas of your expected arrival time in advance. You can use the Special Requests box when booking, or contact the property directly using the contact details in your confirmation. We had to ask for bottled water on most days as room service did not replenish reliably. Not a big deal. 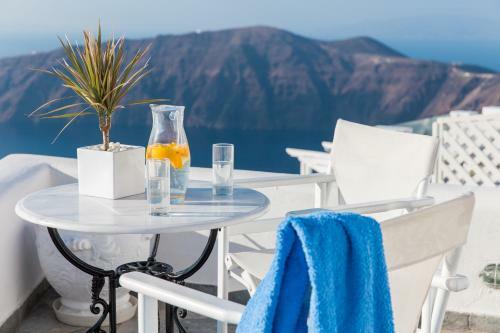 Quite location away from the crowded town with good parking by Santorini standards. Included breakfast is basic but good. Great view, as good as any on the island, in part due to being on the highest point 400m up. Much larger than average room with seating area and small dinning table. We selected this room in this hotel because of these features, the standard 20sq meter room offered in almost all hotels did not suit us. Very friendly and helpful staff. The missing jacuzzi on the terrace. Not having shuttle service to Fira. Although you could take the bus which was a 5 to 8 minutes walk from the property. Fresh bread and croissant was baked daily for breakfast and delivered to our room. They provide all the ingredients for a great breakfast in the kitchen area but we had to cook it ourselves, which was Ok.
great view from room, clean rooms, friendly staff. Our room did not have a direct view of the caldera as stated. The bathroom was also very dingey and really needs updating. It was lovely of them to acknowledge our honeymoon with a fruit basket and wine. Breakfast was great and nicely delivered to our room. The hot tub is really good, and the view is perfect. Staffs are very helpful. Spectacular view! Elena is a gem! Everything at Villa Lukas was absolutely fabulous :) From our pick up at the port, to the warm reception we received upon arrival, to our stunning Cave House - all was absolutely wonderful! Breakfast was stellar - we didn't want to leave! The view and overall room was just fantastic better than I thought!